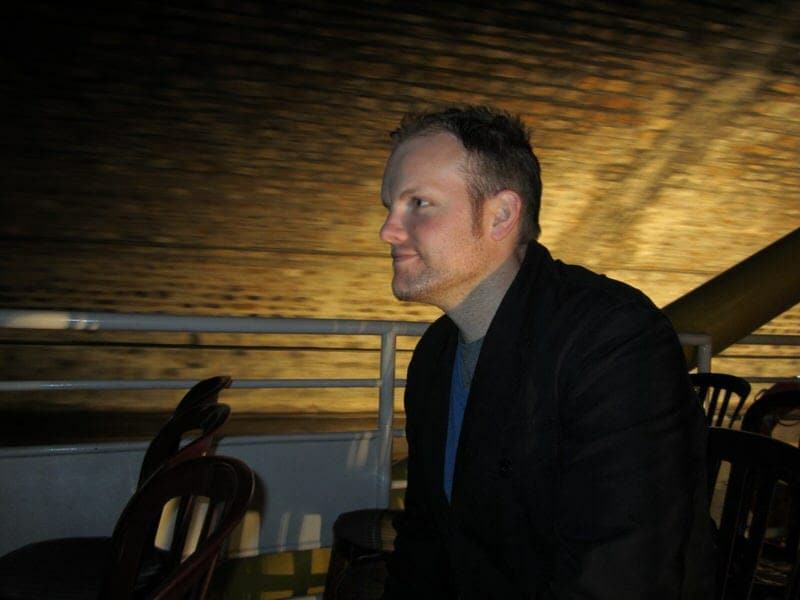 On our last visit to Paris we took a boat cruise on the Canal Saint Martin. While a good percentage of Paris visitors take a boat cruise on the famous Seine River, very few venture onto Paris’ canals. 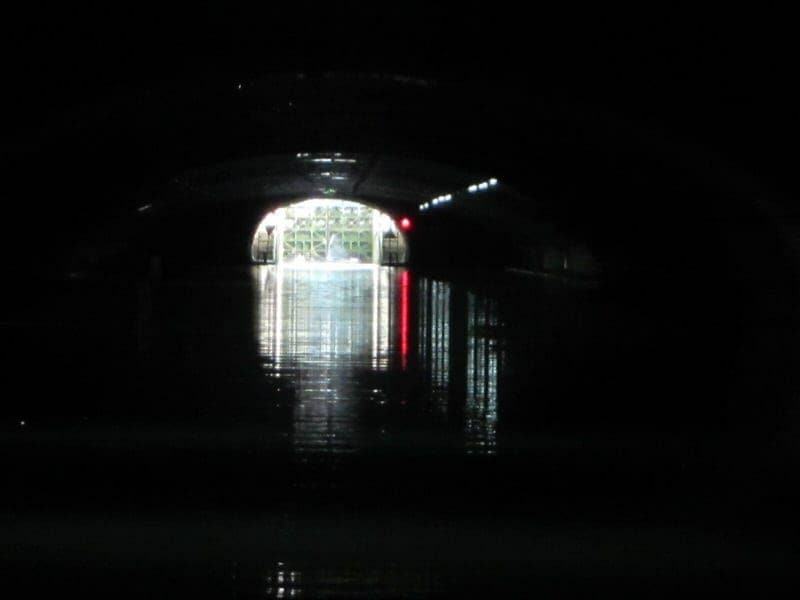 In fact, I think most people don’t happen to know that Paris has canals, let alone that there is over 80 miles of canals that form the Paris canal network, which also includes the interconnected Canal de L ‘Ourcq and Canal Saint-Denis. This canal network was commissioned by Napoleon I in the early 1800’s to provide Parisians with clean drinking water and provide an alternative waterway for industrial boat traffic other than the Seine. 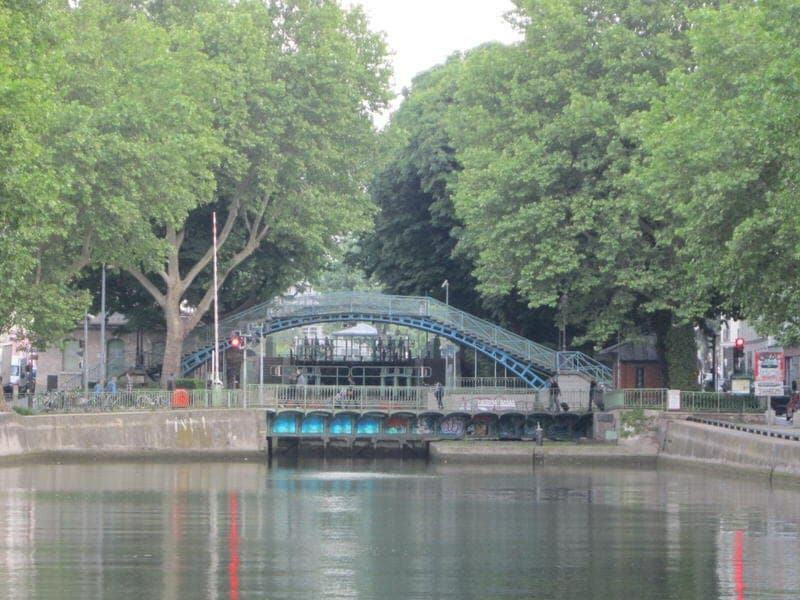 Today there is little industrial boat traffic on the Canal Saint Martin, but the city has recently invested millions of euros in developing the areas around the canal to allow for boat cruises, biking, and scenic walkways. If you’ve already done a boat cruise on the Seine River, you might want to think about doing a cruise on one of Paris’ canals. 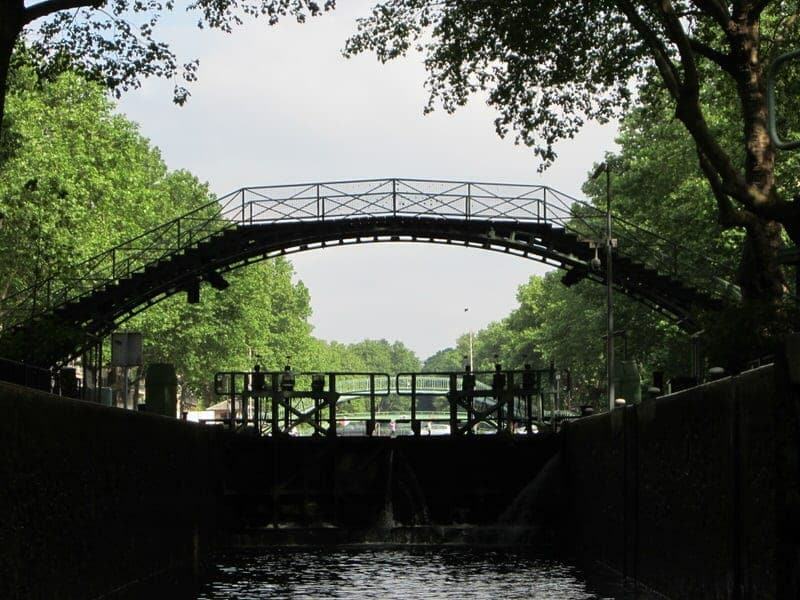 We’ll tell you how to plan your own cruise down the Canal Saint Martin, share our tips, and tell you about our own experience doing a boat cruise on the Canal Saint Martin with Canauxrama. The first decision is to choose a cruise company. 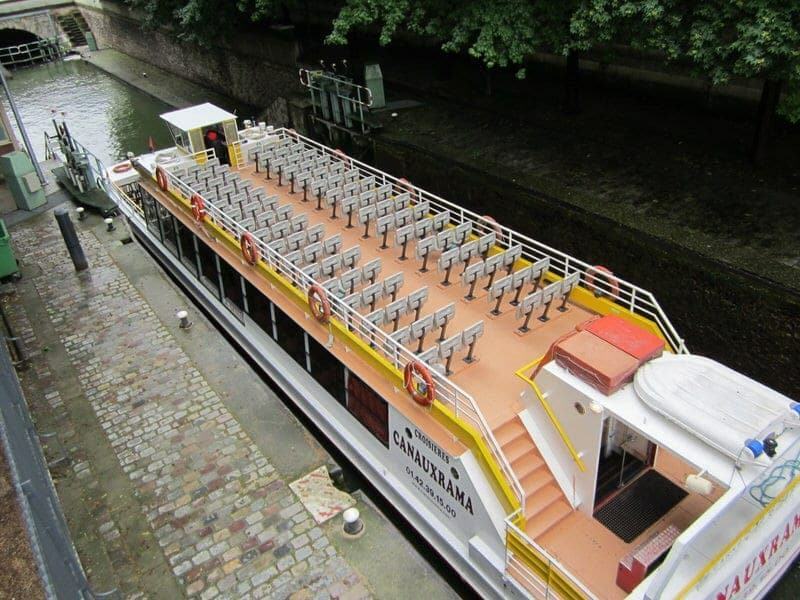 There are two main companies that regularly run cruises on the Canal Saint Martin, these are Canauxrama and Paris Canal. We’ll give you some information on both companies so you can choose the one that best fits your schedule, budget, and location in Paris. Contact Information for Canauxrama and Paris Canal? **Note: The office for both companies are located almost next to each other. 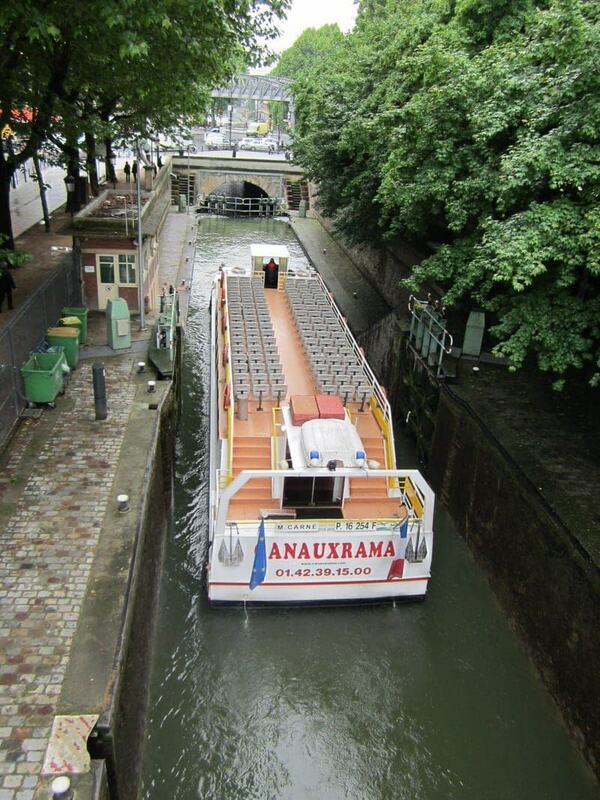 Canauxrama currently offers Canal Saint-Martin cruises year-round while Paris Canal offers them from about March to November. Both provide morning and afternoon cruises, see websites for specific cruise times and dates. Note that all cruises see most of the same sights and that for both companies you’ll start at one of the two locations and end at the other. It is not a round-trip cruise. Bassin de la Villette 13, Quai de la Loire, Paris 19th arrondissement (Metro: Jaurès) Near Place Stalingrad. Port de L’Arsenal, across from 50 Boulevard de la Bastille, Paris 12th arrondissement (Metro: Bastille) Near Place de la Bastille. Quai Anatole France, in front of the Musée d’Orsay, PARIS 7th arrondissement (Metro: Solférino or RER C train station: Musée d’Orsay). Porte de Pantin, near the southern entrance to the Parc de la Villette in front of the red Information/Ticket Center also know as the “Folies des Visites du Parc”, 19th arrondissement (Metro: Porte de Pantin). Cost of Canal Saint Martin Cruise? Adults are 16 euros, children age 4-11 are 8.5 euros, and children under 4 are granted free admission. Students and seniors with valid ID are 12 euros (discount not valid on weekends or public holidays). Special group pricing for groups of 20 or more people. Adults are 19 euros, children (age 4-11) are 12 euros, young adults (age 12-25) are 16 euros, and those over 60 years of age are 16 euros. 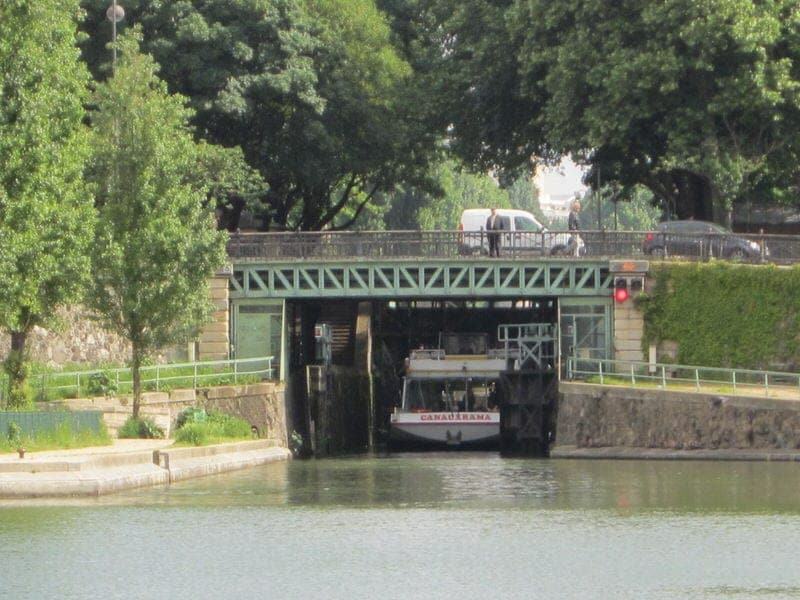 Paris Canal also offers a family deal where 2 adults with 2 children under age 18 can buy a family ticket for 49 euros. Special group pricing for groups of 20 or more people. We could not locate a price for children under the age of 4 so assume they get free admission. Length of Canal Saint-Martin Cruise? The standard Canal Saint-Martin cruise is 2.5 hours. The standard Canal Saint-Martin cruise is 2.5 hours. Note that a short amount of this time is actually cruising the Seine as your cruise will either begin or end near the Musée d’Orsay. However, this is not a replacement for an hour-long Seine cruise as much of the time and focus is on the Canal Saint Martin. Reservations for both companies can be made online or stopping by their office. It is recommended that you make reservations in advance for your cruise. Narration aboard the Boat Cruises? Narration is provided by live guides in both French and English. Typed summaries on the Saint-Martin Canal cruise are also available in the following languages: German, Spanish, Italian, Japanese, Russian, Portuguese, Chinese, and Dutch. Narration is provided by live guides in both French and English. Food and drinks on the Cruise? On the standard cruises, there are snacks and drinks available for purchase; however, note that the offerings are not always consistent and meals are not served. It is best to plan to eat before or after the cruise. There are also toilets available on all boats by both companies. Canauxrama boats do stop at restaurants on their one-day cruises and sometimes offer other cruises that include food. Can I cruise the Canal de L ‘Ourcq and Canal Saint Denis as well? Yes! Not only do both of these companies run cruises on the Canal Saint-Martin, they also have cruises on the Seine River, Canal de l”Ourcq, Canal Saint-Denis, and the Marne River (a river east of Paris that connects to the Seine and was the subject of a number of Impressionist paintings). For us, we chose Canauxrama because it was slightly less expensive for us than the Paris Canal cruise and the Port de L’Arsenal was the closest of available departure points. Also at the time, Canauxrama was offering discounts for tickets booked online. • Make reservations in advance if possible. If you can get a flexible date ticket, then you can try to plan to go when the weather is nice. • Make sure you know the time and departure point of your cruise and figure out where the departure point is beforehand and how much time it will take you to get there. If you have any questions about timing or location that are not answered by the websites, e-mail or call the company and ask for more information. Don’t take a chance at the missing the boat like we did! • Unless the weather is really bad, the boats will take off rain or shine if there are enough cruisers, so dress appropriately as it can be quite cold on the boats (particularly in the mornings) and bring an umbrella or poncho if rain is expected. While all boats have covered and indoor seating, you’ll want to at least come out on deck to take a close-up look at some of the locks during the cruise. • The cruises are fairly long at 2.5 hours so if you are traveling with kids (or adults with short attention spans) bring some things they can do quietly while sitting. Also note that there is not really food aboard so plan to eat before or after the cruise. 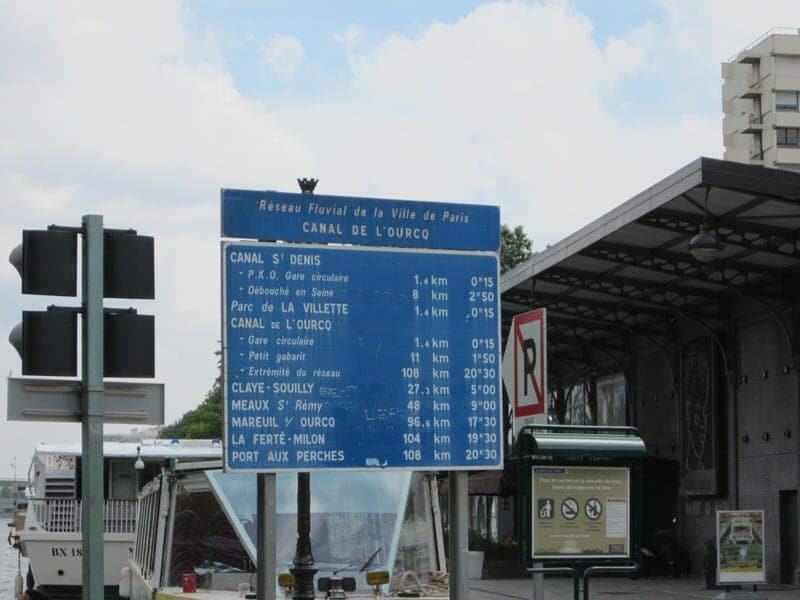 • Leave time before or after your cruise to explore the Canal St. Martin area in the 10th arrondissement and/or the Parc de Villette in the 19th as both are places that most visitors don’t explore. Many cruisers get of the boat and head to the next thing on their itinerary and regret not having time to spend more time in these areas. We spent most of a lovely morning and afternoon walking around the 10th and 12th arrondissements. Prior to leaving for our trip, I had purchased two ticket vouchers online for a Canauxrama St. Martin Canal cruise. We printed them off and they were valid for 1 year after purchase, giving us flexibility about when we actually used the tickets. Once we got to Paris, we chose a day but unfortunately to a series of unfortunate events and not enough planning, we literally ended up missing the boat by about 10 minutes. While initially I got quite upset, we ended up spending a lovely, but rainy, morning spent walking along the canal, exploring the neighborhood, and having a nice lunch at a little restaurant called Chez Marie-Louise. You can read more about that experience here. After some debate, we decided to forgo other plans and come back two days later to do the cruise. We took the morning cruise out of the Port de L’Arsenal. It was rainy and there were about 20 other people who boarded the boat with us. After leaving the Port de L’Arsenal, we navigated our way into an underground stone vault. This interesting vault is 2 kilometers long and lit by 37 lanterns. Sometimes you’ll see a light show or a projected film on the vault walls, but we did not experience this on our particular trip. Our pictures turned out terribly here. Next you’ll come to your first lock, this one a double lock. The guides will explain how the locks work and you can ask additional questions if you want more details on the process. Here is a simple pictorial view of what happens. 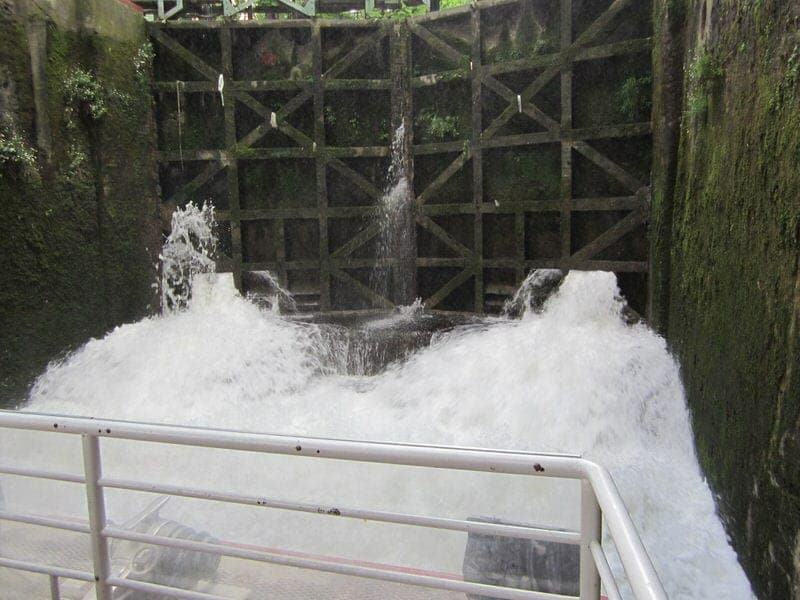 Over the 2.5 hour cruise, you’ll experience a total of four double locks and two swinging bridges. 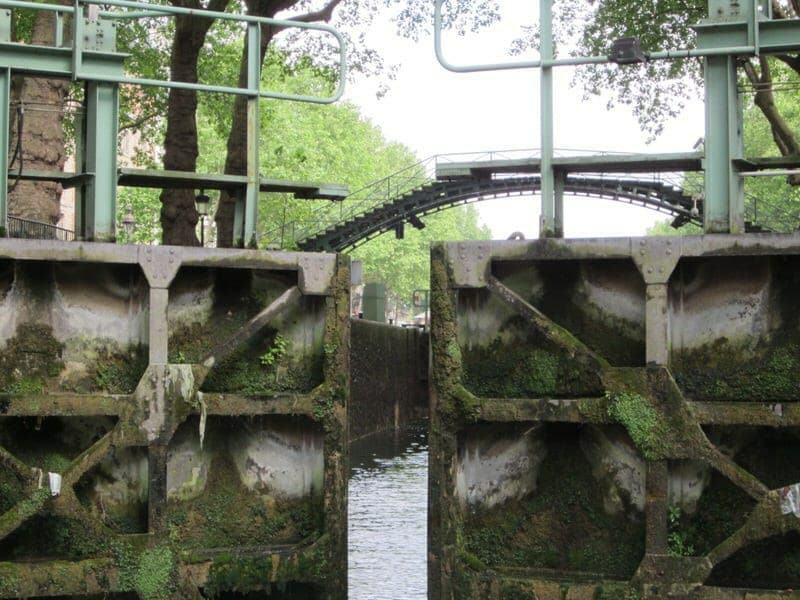 Each lock has its own name and history and this will be shared as you pass through each one. One of the locks that stood out was the Ecluse des Morts which is named after a 4th to 5th century Merovingian necropolis. To expand on the death theme, the Montfaucon Gallows were built on a nearby hill and had the capacity to hang up to 60 Parisians at one time. The gallows were not destroyed until the French Revolution. 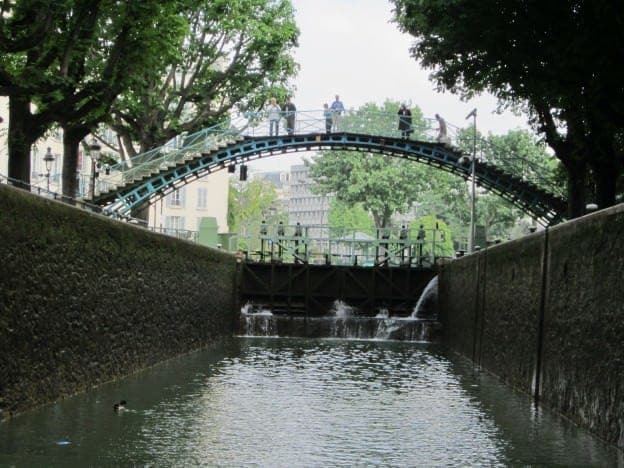 In addition to the locks and swinging bridges, you’ll also glide under a number of metal footbridges as you pass tree-lined streets, cafes, tiny parks, houseboats, and quirky boutiques. People often stand on the footbridges and look down to watch the boats pass by. 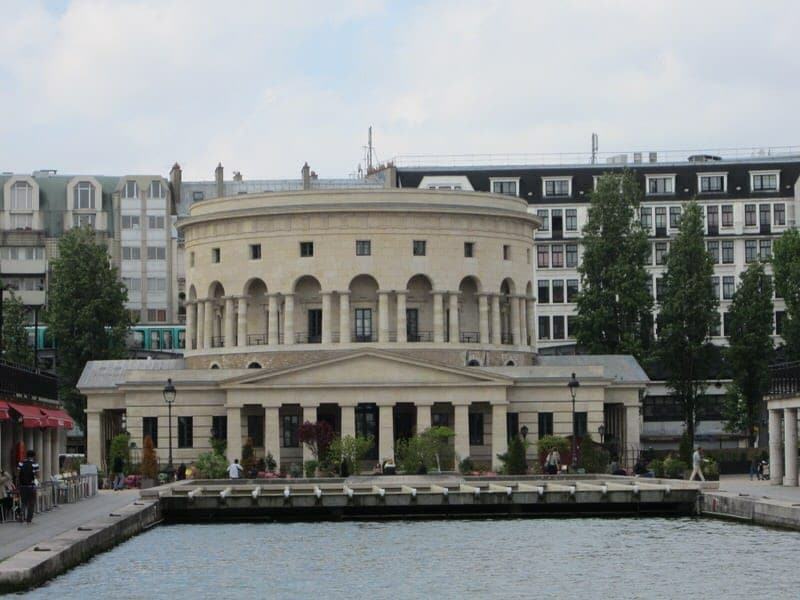 La Rotonde de La Villette was originally built as a tollhouse. Today this grand neoclassical style building houses a restaurant and bar. The guides were friendly and the female guide said everything in both French and English. It was clear that she was a native French speaker and sometimes her English was a bit difficult to understand, but you are also given a printed sheet with much of the commentary so that even if you don’t catch everything the guide says, you can still follow along. They were also happy to answer questions. While inside the boat, we had no problem hearing the narration, but one problem was that when we went to sit outside, we had a really difficult time hearing the guide at all. This was at least partly due to the fact they were keeping the outside door closed due to the rainy weather so it is likely much easier to hear when the door is left open. 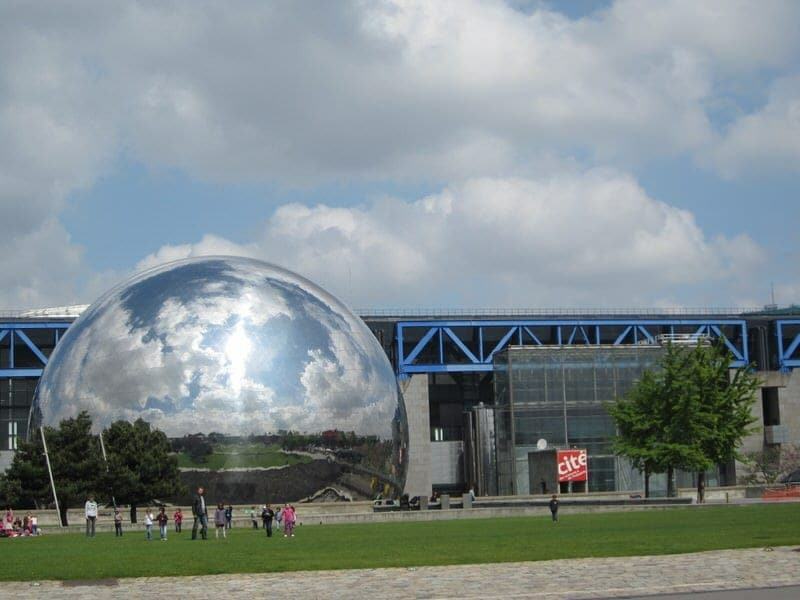 As you move towards the Parc de la Villette, you’ll notice a bit of the remaining industrial buildings and it will look a lot less like the more touristy central Paris. 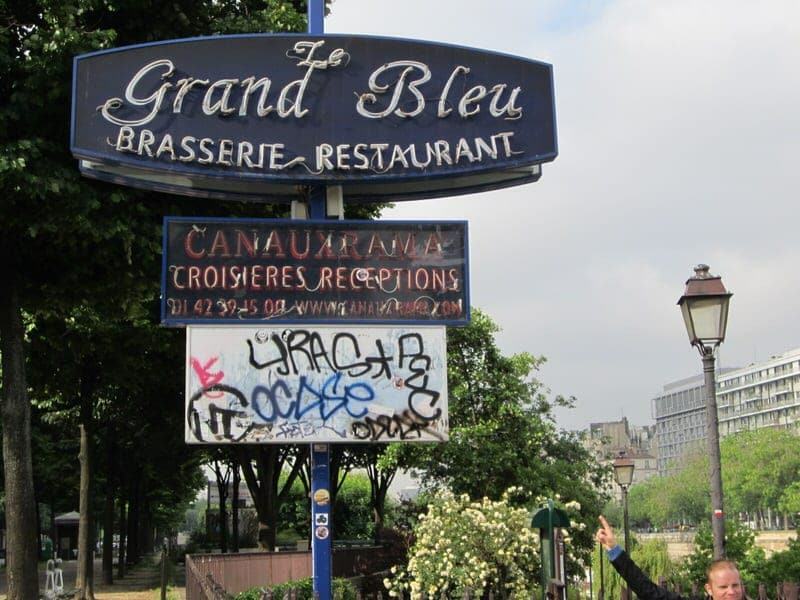 Along the way, you’ll hear about the history of the Canal Saint-Martin, several famous buildings along the canal, and the old village of La Villette. The guides will also share pop culture references along with the modern uses of the canals and the areas along the canal. For instance, the infamous man who stole the Mona Lisa from the Louvre in 1911 lived in a small house along the Canal Saint-Martin. 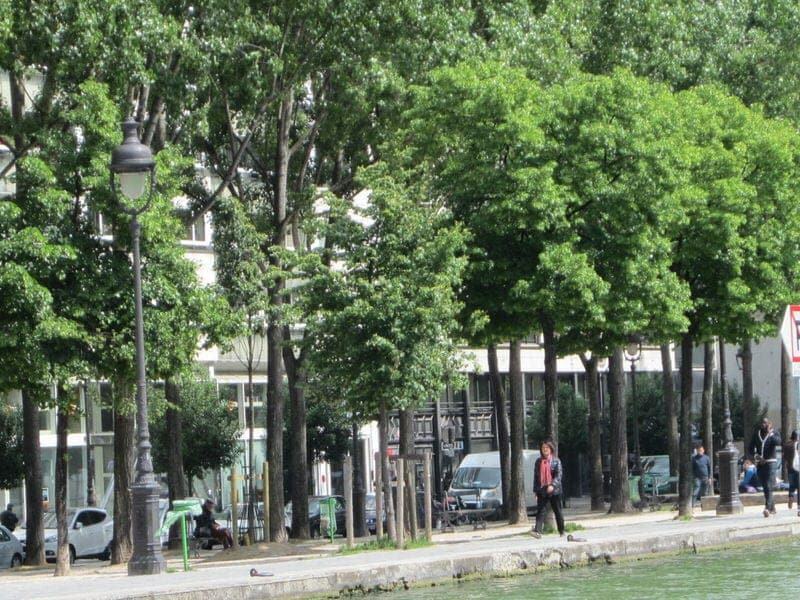 For movie buffs, the Canal Saint-Martin was featured in the 1938 Hôtel du Nord, directed by Marcel Carné which serves as the inspiration for the names of the Canauxrama boats. 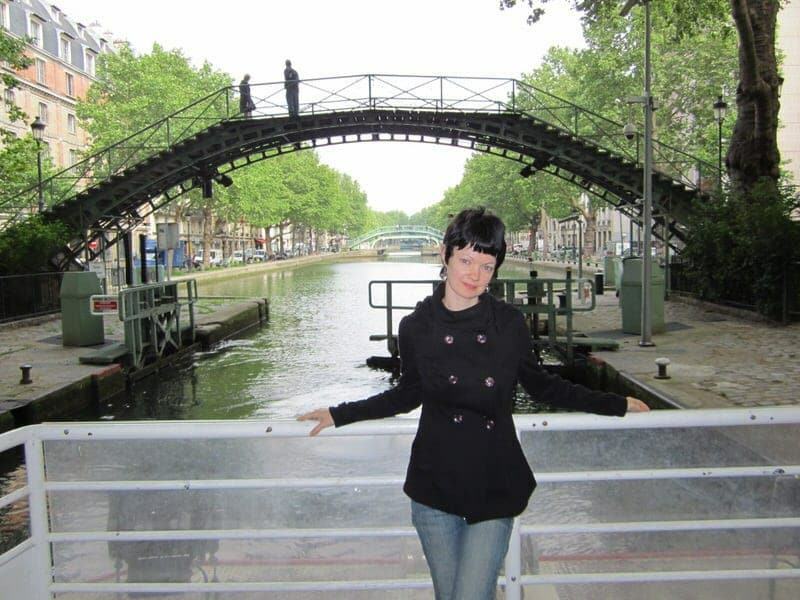 More recently, you might have seen the canal featured in the 2001 movie Amélie where the character Amélie Poulain is seen skipping stones at the locks of the canal. 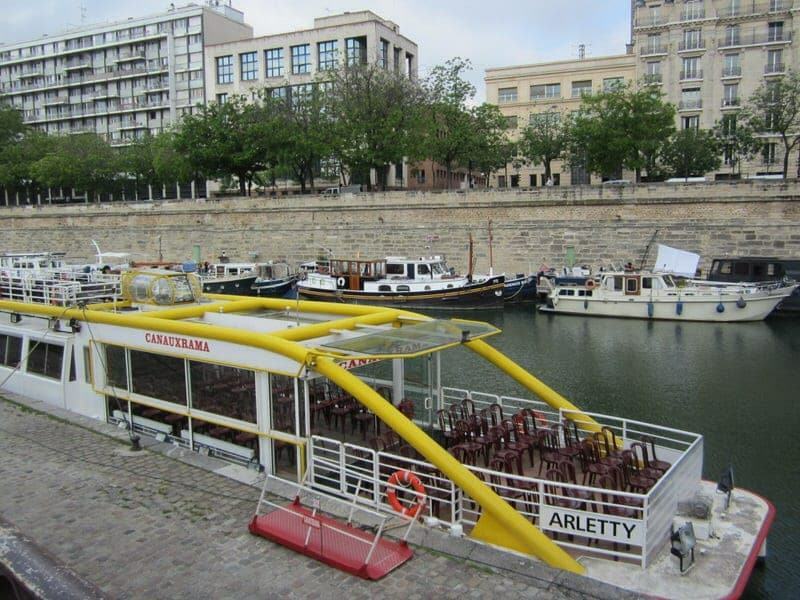 Overall, we enjoyed a very leisurely and interesting cruise along the Canal Saint Martin. While many Paris attractions have you walking around and on the move, this was a nice slow relaxing float down the canal. Now, I do want to note that the cruise is very slow moving as it takes a lot of time to navigate the locks and bridges along the path. I think a few passengers on the boat grew quite bored and disinterested after the first couple of locks as the process is pretty much the same each time. This is definitely not an hour long cruise along the Seine River where you are hit over the head with notable and world-famous sites at every angle. There is nothing comparable to the Eiffel Tower, Louvre, or Notre-Dame along the Canal Saint-Martin so this is something to think about when considering this cruise. 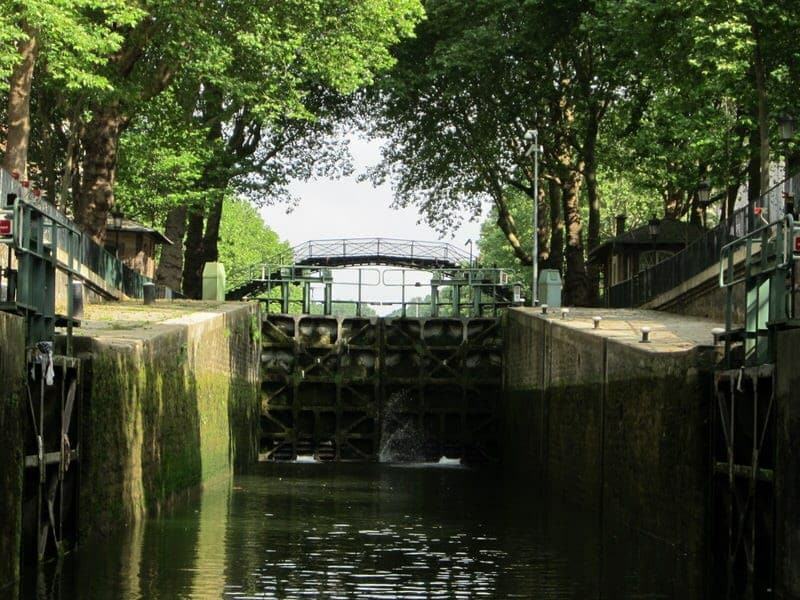 You’ll learn and experience the navigation of locks and swinging bridges, you’ll get to see less touristy areas of Paris, and you’ll learn some history of the area. If this does not sound appealing, don’t take this tour! You can still experience the area, footbridges, and locks by exploring the area by foot or by bicycle. No matter how you do it, I definitely think the 10th arrondissement is an area that deserves to be explored. While we got to spend quite a bit of time in the Canal Saint Martin area on foot, we unfortunately did not have time to explore much of the Parc de Villette, but hope to do so on a return trip to Paris! 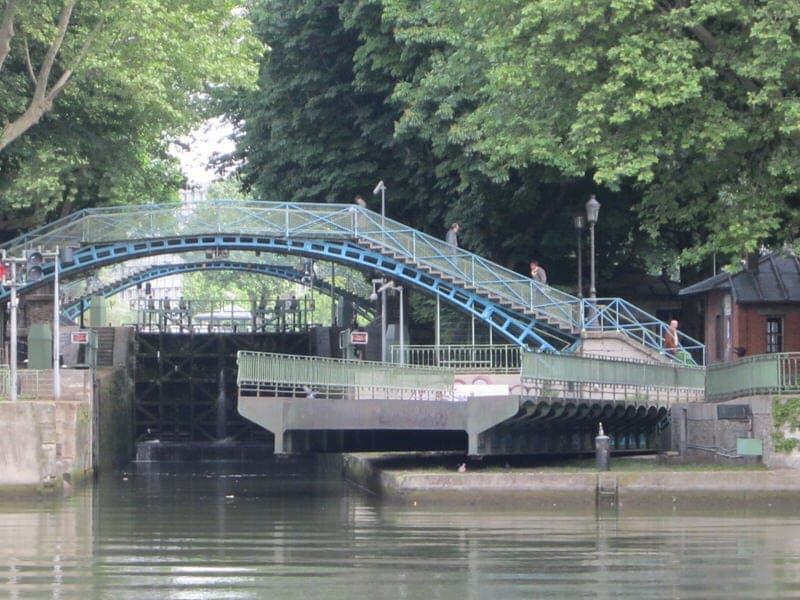 Have you done a boat cruise on the Canal Saint Martin or explored this area by bike or foot? We’d love to hear about your experience and as always, if you have any questions, just ask! Do either of the canal tours allow small dogs (in carriers) on the boats? Thank you for an excellent, detailed post. Told me everything I need to know to recommend to clients visiting Paris. Thanks Mary Ann, glad the post was helpful in helping your travel clients! I never knew boat rides were available on the canal! I just got back from a trip to Paris in the fall and loved every minute there! The canal rides are nice alternatives if you’ve already one the Seine boat cruises. Much slower and peaceful and less crowded. I enjoyed reading this article because Paris is a very beautiful city. Thanks, yes, Paris is such a beautiful city and we discover new parts on each visit. How have I never heard of these canals?! That is shocking, so thanks for posting this. I can’t believe how affordable these cruises are. When I travel France I will have to check them out! I don’t think most visitors to Paris know about the canals or that they can tour them, but it is a great way to explore this area of Paris. We found that by combining a few hours of walking with the tour, we were able to really appreciate this area. I think this is a great idea! You see such a different side to a city from the water. Wish I can go back and experience the city all over again. There are so many things that I would do different! great idea and really informative post – thank you! Definitely bookmarking this idea for next time in Paris . . . its been far to long! Thanks, glad you enjoyed the post. Exploring the Canal Saint Martin (or the other canals) is a great way to see a part of Paris you might not have seen in prior visits. Wow! I didn’t even know Paris had canals. This sounds like a great way to rest your feet and see parts of Paris you might otherwise overlook. Yep, I know! I didn’t know on my first visit either. I used to live not too far from Canal St. Martin – off of rue Oberkampf actually. I loved going to the canal on a sunny day with a good book and a picnic lunch and just passing the day away. It’s certainly a less touristy part of town than others, but has its own particular charms. There are quite a few great cafes and bars, for example. Definitely a part of town worth checking out! Hi Amy, it seems like a cool area to live in Paris. We definitely enjoyed the several hours we spent wondering around the canal and the general area. We also discovered the nearby Parc des Buttes-Chaumont on our walk. Would love to spend more time in this area on future visits.